A charming, earnest and frequently delightful space opera that pretty much matches the hype. We are all made from chromosomes and DNA, which themselves are made from a select handful of key elements. We all require a steady intake of water and oxygen to survive (though in varying quantities). We all need food. We all buckle under atmospheres too thick or gravitational fields too strong. We all die in freezing cold or burning heat. We all die, full stop. Ohhhh boy. One of yesterday's posts was easy -- I state the premise, say the book lived up to the premise, and there ya go. A finished post. Today? I'm not sure I could succinctly lay out the premise in 6 paragraphs, much less say anything else about the book. It's deep, it's sprawling, it's fun and full of heart. What isn't it? Easy to talk about briefly. So I'm going to cut some corners, and not give it the depth of discussion that I'd like to. So you know how The Hitchhiker's Guide to the Galaxy starts off with the Vogon Constructor Fleet constructing a hyperspace bypass right through our Solar System? Well, if the Vogons were the megacorp doing that, the crew of the Wayfarer is your mom & pop-level company doing the same kind of work. But there are no Vogons, and it's not a hyperspace bypass they're constructing, but the metaphor works -- the Wayfarer is building/cutting/creating ways for spaceships to make it from point A to point B faster -- I'll leave the detailed explanation to Sissix or Kizzy to explain when you read it (I think it was Kizzy, but I could be wrong -- my copy is in another state, so it's hard for me to check things like that). The Wayfarer is made up of a mix of species -- including human (some of which were raised on a planet, others not), the others? Well, they'd fit right in with the customers in the Mos Eisley Cantina (with names like Sissix or Kizzy) -- too difficult to explain, but they're all radically different from pretty much anything you've seen or read before. Chambers' imagination when it comes to their physiology, culture, mannerisms, beliefs is just astounding. Really it's fantastic. And the crew is a family -- when a new crew member joins, they're greeted with "welcome home." And that's just what they mean. This new crew member is Rosemary Harper, our entry point into this world, too. She's never been off-planet before, doesn't understand the science behind the work they do, really only has textbook knowledge of most of the species they run into. As she learns, so does the reader. Phew. 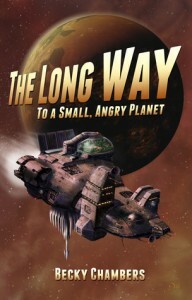 Essentially, the plot is this: the captain of Wayfarer gets a chance to make history and make more money than he's used to -- he jumps at it, but his crew has to take a freakishly long trip to get to the (for lack of a better term) construction site (see the title). This long trip is filled with dangers, encounters with family members no one has seen in ages and old friends. And pirates. Even when they get to the construction site, the challenges are just beginning and everyone on board is going to be put through the wringer just to survive. In the midst of all this is laughter, love, joy, pain, sorrow, and learning. Rosemary becomes part of the family -- by the actions of the crew bringing her in, and through her own reciprocal actions. Now, many parts of this book seem slow -- but never laboriously slow -- it's the way that Chambers has to construct it so that we get the emotional bonds between the characters -- and between the characters and the reader -- firmly established, so that when the trials come, we're invested. I was surprised how much I cared about the outcomes of certain characters at the end -- it's all because Chambers did just a good job building the relationships, nice and slow. The book frequently feels light -- and is called that a lot by readers -- but don't mistake light for breezy. I want to stress, it's not laboriously slow, it's not boring. It's careful, it's well-thought out. It's your favorite chili made in the slow cooker all day, rather than dumping the ingredients in a pot an hour or so before dinner. It occasionally bugged me while reading, but by that time, I was invested and had a certain degree of trust for Chambers -- and by the time I got to the end, I understood what she was doing in the slow periods and reverse my opinion of them. I frequently felt preached at while reading this book. There were agendas all around and these characters did what they could to advance them. Most of the speechifying and preaching worked in the Wayfarer Universe, but not in ours. When I read it, I had no problem with it -- but the more I think about it, the less I agree and the more annoyed I get. The opening quotation was one of the themes pushed, another had to do with family and/or brothers -- but the best lines about those involve spoilers or need the context to be really effective, so go read them yourselves. I don't want to get into a debate with the various characters in the book, so I'll bypass the problems I have with just the note that I have them. But in the moment and in the context of the novel, the writing behind the characters' points/values, the emotions behind them are moving, compelling and convincing -- and that's what you want, right? It is super, super-easy to see why this won buckets of awards -- and probably deserved most (if not all) of those awards. This is one of the better space operas I've read in the last few . . . ever, really. It's easy to see why it got the hype and acclaim it did, and while I might not be as over-the-moon as many readers are with it, I understand their love. I heartily enjoyed it, and can see myself returning to this universe again soon.